The hip-hop star was performing to a packed stadium in Greenboro, North Carolina, when he spotted a 12-year-old boy in the crowd holding a sign that said: "Can I rap for you?" Footage posted on the internet shows Jay Z invite the fan, a boy called Justin from Maryland, on stage and introduce him before giving him a microphone. Justin said: "I don't need no music," and then looked extremely nervous as he began to psych himself up, only to launch into a verse from the rapper's hit C lique. Jay Z - who became a father last year when he and wife Beyonce welcomed daughter Blue Ivy - interrupted him halfway through and told him to skip the "drug dealing part" before Justin became more confident and belted out the rest of the rap as the crowd cheered. 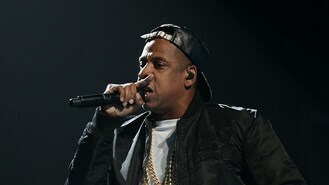 Jay Z congratulated him with a big hug and then told the audience: "After all that he said, 'Can I meet you backstage?' Yes you can, but just because of the nerve!"